Red Garland and Miles Davis had a symbiotic relationship. Red was such an important cog in the Davis quintet as a soloist, interactive accompanist and keeper of the repertory. Being in Miles' group gave Garland the exposure he otherwise would not have gotten. Once Garland's talent as a pianist, with a boundless repository of material in his head, was established, Prestige's Bob Weinstock signed him to a contract as a recording leader in his own right. 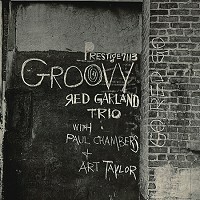 With his Davis section-mate, Paul Chambers, on bass, and New York drummer Arthur Taylor, Garland formed a trio that met quite often in Rudy Van Gelder's studio. Groovy was the third in Red's trio series for Prestige and it has the usual fine mix of jazz standards, ballad standards, blues ballads and just plain blues. It is an object lesson in finding and maintaining a groove.